Before we announce the winners of this year’s My TV Awards, we’re proud to present the 2010 My TV Interview series. 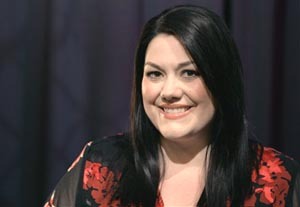 Today’s interview is with Brooke Elliott, the remarkable star of Lifetime’s Drop Dead Diva. Brooke is nominated for Best Actress in a Comedy for her work as Jane Bingum, the soul of a supermodel in a size 16 lawyer’s body. At first, when I was growing up, I wanted to be Barbra Streisand. That’s what I wanted to do, I would be another Barbra Streisand. Then as I got into high school, and the option is drama club not Barbara Streisand club, I got into drama. And I found that I really belonged there. So I pursued that in college and then professionally. I always knew I would do something in the entertainment field, that was my calling. Do you consider yourself primarily an actress or a singer? Both, actually. I spent a long time in the Broadway world, touring and stuff. So both, it’s singing and acting, and now I’m getting to do both in [Drop Dead]Diva too so I’d really say both. Who are some of the performers who’ve always inspired you? Apart from, apparently, Barbra Streisand. When I was younger, Rosie O’Donnell, so it’s great that she ended up coming on the show. And she gave me my first job on Broadway. In college you had to do a senior recital sort of thing, and I did “The Brooke Elliott Show”, which was based on Rosie’s show. So it’s really funny that I ended up meeting her later, but she was a big mentor of mine. Kathy Bates, too, was a big mentor of mine. What’s been your favourite Broadway production to be a part of? It’s funny because there’s so much I like about each one of the shows I did. I think Taboo was one of my favourites. It was a very challenging show to be a part of but a lot of fun as well. Yeah I’ve always loved it. Ragtime is always one of my favourites. Jesus Christ Superstar is actually my all-time favourite. I love the music of Wicked. I was in Wicked, which was a lot of fun, but I love the music, I never tire of listening to it. So do you like Stephen Schwartz in general or is Wicked specifically close to your heart? I love Stephen Schwartz. It’s funny when I think about my audition for Wicked because I sang “Meadowlark”. I don’t know if you know “Meadowlark”, but it’s one of Stephen Schwartz’s hardest pieces. I remember thinking “what am I doing singing one of Stephen Schwartz’s hardest pieces TO Stephen Schwartz? Why am I doing this? !” It ended up paying off, but I still marvel that I did that. How did you go on to land the role of Jane on Drop Dead Diva? Pirate Queen had closed on Broadway and I spent a lot of time taking TV and film classes. The writers strike happened so there was nothing going on. And right after the writers strike happened this audition came about and I remember I had an audition for a Broadway show that day, and for Diva. So I went in for both, thinking it’d be great to book something, nothing’s been going on. So I ended up going through the process with Diva and booked it. I’m actually on set pretty much all the time. I work about 15 hours a day. I’m usually on set about 14 hours a day then I go home and work another hour to two on the next day’s work. Since I play Jane I’m in the majority of the scenes, so I work every day. Then Saturday I lay on the couch. Sunday I prepare the next couple days, so I work all day Sunday usually too. So it’s really intense for like 5 months then we’re on our hiatus and usually for about a month I sleep. How do you fill your hiatus- do you book other jobs or travel? I’ve traveled a bunch. In this last hiatus I had the opportunity to go and do some press in Mexico City, Madrid and Paris, which was amazing and so fun that I got to do something like that. And my team and I are looking for something that we think would be right in terms of projects. I didn’t actually work over this hiatus, I did publicity for Diva. What would you say are the most challenging and rewarding aspects of working on a show like Diva? I’d say the most challenging is the amount of hours that you work. And it’s pretty intense work that you’re doing for long hours. Because of the nature of Diva, the most rewarding parts are that people are really effusive with how much the show means to them and how much it’s touching their lives and making them feel better and stronger. It’s very rewarding to be part of a show like that. Do you have a favourite moment or episode? My favourite episode was from season one and its with Gregory Harrison. He wore bunny ears in the courtroom and I had to prove that he wasn’t crazy. We had so much fun, he was such a wonderful addition to the cast that week. I had so much fun on that episode. What has surprised you the most about playing Jane? I keep saying to the writers as a joke that we need to have someone show up at the door and say “why haven’t you picked your kid up from daycare for two years?”. The writers come up with so much stuff that makes me go “alright, this is a new thing for Jane”. I guess something that surprised me was an episode last season when I got to play old Jane and new Jane in the scenes together. That was really fun and really challenging because, if you think about it, I don’t actually know old Jane, I play new Jane. So I was like “oh my gosh, I have to figure out how to play this other character that I never actually play”. So that was a really fun challenge and a surprise. How do you differentiate the two? Deb is such a very specific personality inside Jane’s body. And I’ve really gotten to know her as I create her with the writers. It’s interesting to play old Jane, she has a shyer quality to her. Old Jane, to me, is absolutely beautiful, but I don’t think she knew that. We know people like that in life, who are so beautiful but don’t know they are. I think that that is old Jane. That’s a completely different personality to play than Deb, who knows absolutely how beautiful she is. Then to have that challenge of being in this new life and having her world rocked like that. They’re so different and putting them together makes an awesome new character. So then would you say when Deb enters Jane’s body she no longer thinks she’s beautiful and that really effects who she is as a person? I think that Deb does have challenges with that in the beginning. She has such a very shallow, closed mind about what beauty can be- beauty must exist in this tiny little box. So when she first gets into Jane’s body she is rocked by that. She’s like “wait a minute, I’ve always believed that this type of person isn’t beautiful. But wait a second, because how am I not beautiful anymore?”. So she really is challenged by that at the beginning. Then, as we see through the seasons, she comes to find out how beautiful Jane is and how much fun she has in this new body and this new life. What would you say is the key to playing a character outside of her own body? When we first did the pilot, I had a very specific opinion that she’d be very bumbly and clumsy at first because she’s trying to get used to this new way of moving. So much of who you are is built around what you look like and how people have always seen you. So, playing that sort of disconnect of somebody who is very different from the body she inhabits, is there a trick to getting that dichotomy down? I would say yes and on the other hand I would say no because I know a lot of women who believe, and I know at times in my life I’ve felt this too, that the person inside of them is not the person that people are responding too. Because you’re right, people do respond to our outer appearance first. I know so many women who say “if you knew the women inside me, if you saw the real me…”, so many people are like “are you kidding me? I have this gorgeous 5’9 model inside of me”, I’ve heard people say that to me. So on one hand you would think that it’d be hard to play such a dichotomy but on the other hand I feel like we all live it anyway. What’s your dream project you’d love to work on someday or someone you’d love to work with? I kind of want to do a new version, not even a remake, my version of Kathy Bates’ Misery. I’d love a role like that, where the character is just slightly off. Or maybe not even slightly off, fully off. I would love to play a role like that. When do you start back for season 3 and what’s next for Jane? We start back shooting in March. And I haven’t seen a script yet so I’m not really sure, but I think Jane is going to delve more into the dating world a bit more this season. And she’s going to have to deal with Grayson, whether he’s going to come out of this; if he does, what does she do? There’s a lot of that for her. But I think she’s going to be a lot of fun this season. The writers have said that the course of the series will eventually move the characters to a place where Grayson and new Jane can be together. Are you all for that? I am. My favourite stuff is when you see them getting closer and then you see them apart and you think “well of course they’re meant to be together” but then you think “well, Jane is changing and maybe her path is changing”. If you change your circumstances do you change your fate? I love that kind of idea and that whole world of going back and forth.